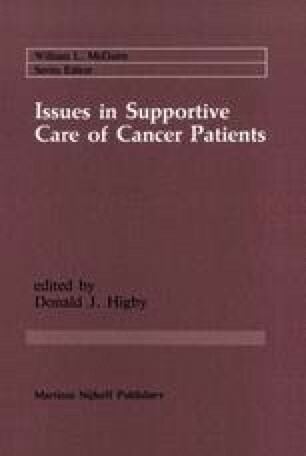 The goals of this chapter are to discuss the principles of normal host defense mechanisms against infectious diseases, to describe the clinical circumstances in which host defense mechanisms break down in cancer patients, and to give some examples of the types of infectious processes which may occur in the secondary compromised state related to malignancies. This chapter is not intended to be an exhaustive review of the literature nor an encyclopedia of infectious diseases in cancer patients. Rather, its object is to discuss how host defense mechanisms normally reduce susceptibility to infectious diseases. By understanding the relationships of host defense mechanisms and specific infectious processes, it is possible to devise prophylactic and therapeutic maneuvers to reduce the morbidity and mortality from some infectious diseases in cancer patients. One other disclaimer: this chapter will not deal with the defense mechanisms against nor the infectious processes caused by multicellular parasites and most unicellular parasites (with the exceptions of Pneumocystis carinii and Toxoplasma gondii).